So, as some of you may know, last week I officially entered my 30's. Okay, so yes, I was 30 for a whole year, but not until I turned 31 did I feel like I really entered the 30's. I was just 30 before. But last week I took that next step into a decade that has always sounded so ancient to me. There's no turning back now. To honor my big day, my parents had us come down to O-town so they could make my birthday complete with dinner and cake and all that jazz. My mom gave me the option of having her make her homemade pizza (which is my favorite pizza by far!) or taking us out to dinner to the local "fancy" restaurant. It was a hard choice, but the temptation of no food preparation, no clean-up, and no dirty dishes won out in the end. Plus, it's a breeze taking 3 kids ages 4 and under to a restaurant. Right? When we arrived at the restaurant, we found out that there was a big party going on, so the only seats left were in the bar area with very tall bar stools. Great for kids... ha. My parents were highly disappointed since they frequent this restaurant every Friday night and are used to their "usual" seats. But we made do although the "girls table" (yes, we had to sit at different tables) tipped precariously back and forth causing our food and drinks to slide all over. And poor Tate had to sit in two highchairs stacked on one another and still could barely reach his food on the table. Back at the table, my food was still warm. All was not lost. And then Tate started fussing. Loudly. Hmm...I thought, it's not like him to be so fussy. I wonder what's wrong with him. We let him fuss a little more, thinking he would stop, but all he did was get louder and louder. Being the courteous restaurant patron that I am, I didn't want him to disturb the other diners, so I picked him up to hold him on my lap. But as I lifted him up, I felt a squishy substance oozing through my fingers. Yes... Poop. It was poop. Lots and lots of poop. I panicked realizing that we didn't have any diapers left. But my mom came up with the perfect solution... Chad trotted off with Tate to the men's room while Mom took Millie to the ladies' room. When they returned, Millie was wearing her soaking wet shorts (commando-style) and Tate was happy in his clean diaper lent to him from his sister. Another successful meal out. However, it ended on a good note when I got my free birthday cupcake. Which, of course, my girls quickly devoured. But back at mom and dad's, there was this big yummy cake waiting for me. Angel food - my favorite! Please try to hold back on your nasty candle comments. Yes, it's a wonder the house didn't burn down. Yes, it did take nearly an hour to get them all lit. Yes, it took me several tries to get them all blown out. Yes, the candles cost more than the cake. Ha, ha. You've had your fun. Now get over it. Anyways, not only did we celebrate my birthday back in my hometown, we also got to go to the good ol' Southern Iowa Fair! The highlight for the girls was riding the ponies. After the rodeo Addie attended, she's now an old pro at riding horses. It's much easier to stay on a horse than a sheep. And of course, the fair isn't complete without posing by a race car. Well, that's my birthday story. If you learned anything, I hope it's this: When given the choice, always choose the homemade pizza. Today marks Chad and I's 10 year anniversary. Does that mean we're old? I'd love to write something long and sappy, but unfortunately, I just don't have time right now. Instead, you can read about how it all started here. So, our second honeymoon is nearly over. And it has been amazing! We tried to cherish our last day, by taking in a few local sights and relaxing together. We started out by going to the Betty Ford Gardens right behind our resort. I'm telling you, the location of where we stayed was perfect. The Gardens, the Amphitheater, the Creek and the walking trail into Vail were all located right behind our resort! The Gardens were beautiful, of course. Chad got a little tired, so he found a bench to rest on awhile. If you look closely, you can see that these trees are split down the middle - one half still standing, the other half laying down as benches. Pretty cool. After enjoying the beautiful gardens, we headed down to the pool where Chad grilled some brats for lunch. Then we swam and soaked in the sun for a few hours. They also had a couple nice hot tubs, but it was too hot for that today. This evening, we headed into Lionshead to walk around and have dinner. Chad found some cool chairs made solely out of skis. And they were actually pretty comfy! We dined on some BBQ at Moe's Original Barbeque. Don't let the picture deceive you. The portions look small, but boy are they filling! This is definitely a place you need to check out if you're ever in Vail. A platter costs just $10, and it includes 2 sides and drink! Finding prices like that in Vail is like finding a secret treasure. After dinner, we hung out at the resort and enjoyed our last vacation evening together. This is the view of our resort from the back. Our room is on the top floor, third balcony from the right. Our living room, where I'm typing this blog right now. Being on the fourth floor also had the benefit of a vaulted ceiling with natural sunlight streaming in. Now for the long trip home tomorrow (or today, depending on what time zone you're in). We're not sure if we'll make it all the way in one day or if we'll stop somewhere Saturday night and finish on Sunday. But I know my arms are aching to hold my little munchkins again!!! Giving hugs over video chats just isn't the same as holding them in my arms and smothering them with kisses. Thanks for tuning in to read about our trip. Hope you all have a great weekend! So, after my last post on Wednesday, Chad and I headed out to take on a nearby hiking trail. This trail climbs 1400 feet in 2 miles. Translation: Yikes! The trail looked like this most of the way (which looks steeper in person, of course). But it had a beautiful view of the aspens along the way. And too many different wildflowers to count. Stopping in the shade for a breather and some water. For part of the trail, we actually had to climb up a stream. Watch out for slippery rocks! And maybe just a little tired. Thursday morning we got up bright and early and headed over to Glenwood Springs to do some whitewater rafting on the Colorado river. Here we are posing in front of the river. Here I am looking dorky by the trailer of rafts. The best part of this picture is my sandals. I bought these Nike sandals 16 years ago for the last rafting trip I took in Colorado. I remember saving my babysitting money and picking them out in the Eastbay catalog. They still look brand new, although very outdated! We didn't purchase pictures of our trip, because they cost almost $40 for a CD! So I just stole some from their website instead. 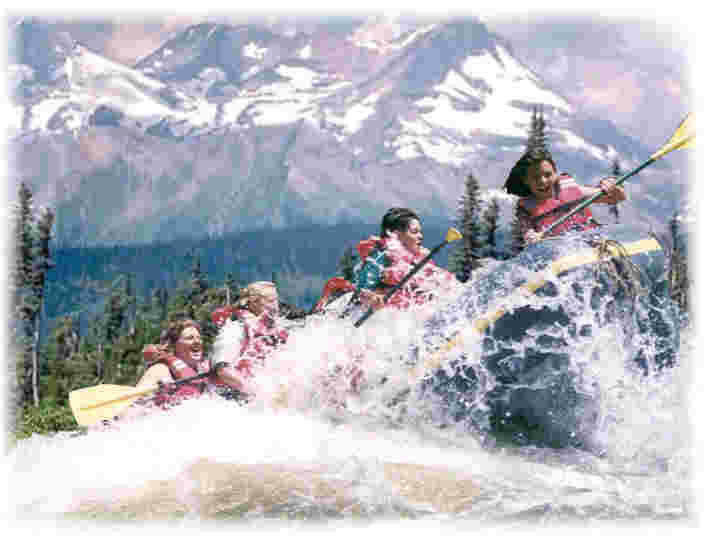 For the morning trip, we were in a raft like this in the Glenwood Canyon. We took on some Class 3 rapids. I, somehow, seemed to be the only one to catch nearly every rapid right in the face. That was soooo fun! I would do it every day if I could! Chad loves the big rapids, so we tried to take on as many as we could. One we hit so hard that our kayak folded up like a taco. Not kidding. Our guide saw it and was pretty impressed. It was great bonding for us too. Nothing brings two people closer together than sharing an adventure! That night we cleaned up, donned our new shoes, and headed downtown for dinner. Isn't this picture hilarious? I love our big head/little body look. We ate outside at Bully Ranch. Chad enjoying his tasty Nachos. And I ordered Ham and Gouda Mac 'n Cheese. Yes, that's right. Take me to a fancy restaurant and I'll get the mac 'n cheese, please. But it was so "gooooud-a." The best part was my view. After dinner we walked around town, looked through some shops, and settled on some Marble Slab ice cream. This is my "Oops-I-ate-my-icecream-all-gone-before-getting-a-good-picture-of-it" face. Only one day left! This trip has been amazing! The best part, of course, has been spending quality time with this man. We made reservations for 7:00 (which is when it opened), and when we arrived, we were the only ones there! It was a little awkward for the first few songs since they (all 6 of them) were singing directly at us. We had to do a lot of smiling. I'm sure it was awkward for them too. Luckily, after 2 songs, the place started filling up. This is our waiter. He was very animated. Silly me. I forgot that these restaurants don't have very big portions. When you order the "Garlic Chicken Skewers" that's exactly what you get. No rice, veggies or nothin'. Better savor every little bite of chicken! I should've ordered a sandwich like Chad. At least then you get bread which is more filling. After taking in the Cabaret (which really was a lot of fun), we did some exploring around Vail. This is the creek that runs directly behind our resort into Vail. Posing in front of the dancing fountain. Which was currently not dancing. A truly beautiful sunset over the Vail ski slopes. Chad found a good buddy of his just chillin' on a bench. Chad teaches physical science, so he and Einstein go waaaaay back. Monday morning, we got up bright and early and went out to play some tennis. The courts right next to our resort charge $15/hour!!! So, being the frugalistas that we are, we found some courts in Avon (about a 10 minute drive) that were free - as they should be! We hadn't played tennis since before our babies were born - so at least 5 years!!! It felt good to be back on the courts. Chad used to coach tennis in Michigan and we both played in high school. Chad, on the other hand, didn't loose his perfect form. After a fun morning of tennis, we had lunch and headed out to Glenwood Springs area to go on a hike up to Hanging Lake, which we heard was fabulous! However, after our 45 minute drive, we found out that the trail was closed for repairs! Bummer! But the trip wasn't all a waste. We got to drive through the beautiful Glenwood Canyon, which was hands-down the coolest drive we've ever been on! Pictures really don't do it justice. Later that afternoon we headed into Lionshead, which is pretty much attached to Vail. The highlight of our day of course, is getting to talk to our little sweeties. After exploring Lionshead, we journeyed back to Vail and had dinner at The George. I love me some King Crab Legs!!! 1 pound of King Crab legs is only $16! Not bad if you've seen the prices at other restaurants in Vail (more in the $30 range). So if you're looking for good food at great prices, The George is the way to go. All entrees are just $16! Tuesday morning we decided it'd be nice to get some shopping done without the kids. For their benefit, and also so we could buy some birthday gifts (since birthday season is right around the corner at our house...) There are some great outlets just 30 minutes from here, so we took advantage of those! These are the most comfortable shoes I have ever worn! And I got them for a steal! Yes, I know they're red, but I'm now declaring that red goes with everything. Except maybe pink and orange... So really, I can wear these with nearly every outfit, right? After a full day of shopping, we attended the free concert at the Ford Amphitheater (almost directly behind our resort). We saw a great folk-rock band. They were quite good, and did I mention... FREE? Then we strolled back into Vail for dinner at Pazzo's Pizzeria - yummy! This is the beautiful trail behind our resort. After dinner we caught another free live band. This time it was bluegrass and we had ourselves a toe-tappin' good time! 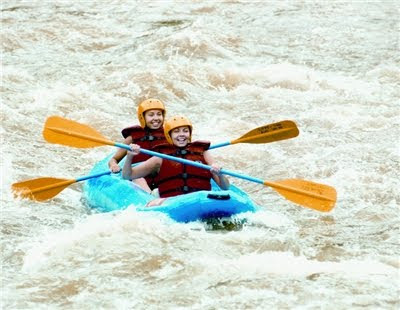 Tomorrow is white water rafting. I'm ready for some thrills and spills! However, I'm a little worried what this trip is doing to Chad.